Small-ship cruise company American Cruise Lines has announced the name of its latest vessel, which is currently under construction at Chesapeake Shipbuilding of Salisbury, Md. The name American Constitution was inspired by the USS Constitution, the United States Navy’s oldest commissioned naval vessel afloat and named by President George Washington. This new ship will be delivered in 2018 and is the sister ship to the American Constellation which begins sailing in May 2017. The American Constitution is a coastal vessel with full active wing stabilization. With the capacity for approximately 175 guests, the new ship will cater to passengers looking for the sophisticated and intimate experience of a modern smaller ship. As with the other American Cruise Lines ships, American Constitution will have large well-appointed staterooms with private balconies, as well as a variety of spacious lounges. The two sister ships will elevate the standard for small ships on both coasts of the United States, cruising on the East Coast this year, and expanding to the Pacific Northwest and Alaska in 2018, the company said. 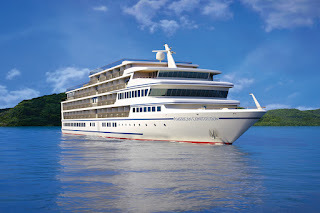 Reservations for the inaugural season aboard American Constitution can be made on the cruise line’s website.